Congradulations! Just looking for "how many calories needed to maintain weight calculator," shows that you have the right attitude. It shows that you have a long term view of maintaining a healthy weight. Now you must maintain that attitute for the long term. You must keep your good habits. This site is all about giving you those tools to help you recognize a problem before it is too late. This calculator is a starting point for deciding how many calories are needed to maintain weight. Where does this calculator come from? It comes from average results of a variety of people. It is not an exact science so make sure you keep a journal or record of some kind. A good journal should be there to remind you of your goal and what you need to do. I use weight loss journals, because I tend to gain weight and need to be reminded to go on a diet as soon as possible. 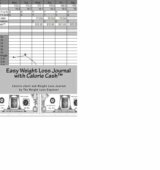 Most people need to lose weight periodically and that is why the charts and journals on this site are labeled as weight loss journals and weight loss charts... ,but you should find these charts and journals useful even if you need to gain weight. Just remember that it is not just weight that is important. the quality of that weight is also important, so you may also want to keep up with your percent fat. Please, return the favor of the free book by sending a link to this page. Just tell them it is to help them maintain their perfect or ideal weight.